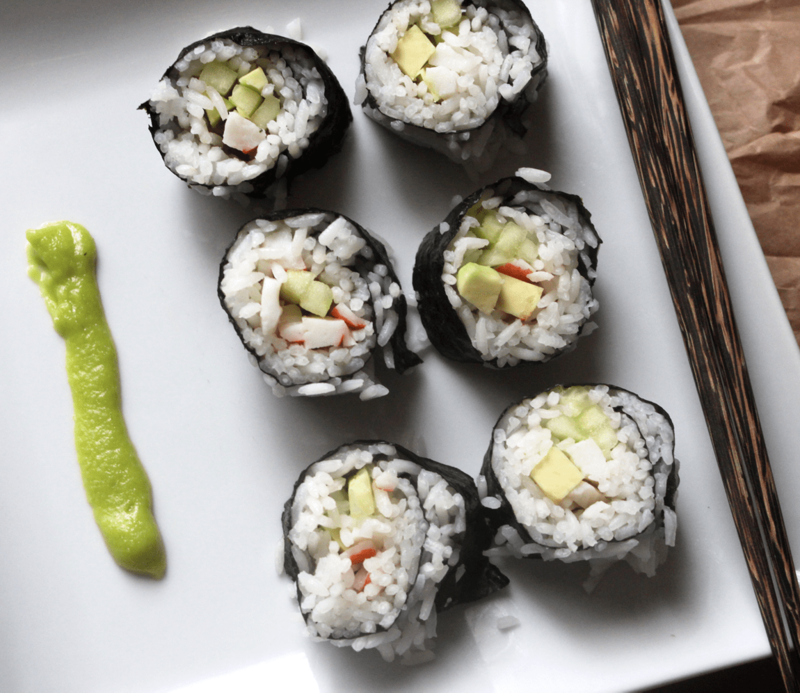 That’s where these homemade sushi rolls come into play. They are actually pretty easy once you figure it out. My very first roll fell apart. Let’s be real here, it wasn’t even a roll. It was a mess. Be mindful that the first roll or two won’t be the prettiest. After you get the hang of it, everything goes really quickly. Don’t give up. Now, there are some resources that can teach you how to use a towel to roll these like this post from The Minimalist Baker. I bought my mat from Amazon though for $6. Totally worth the investment. It came with two mats and a rice paddle. 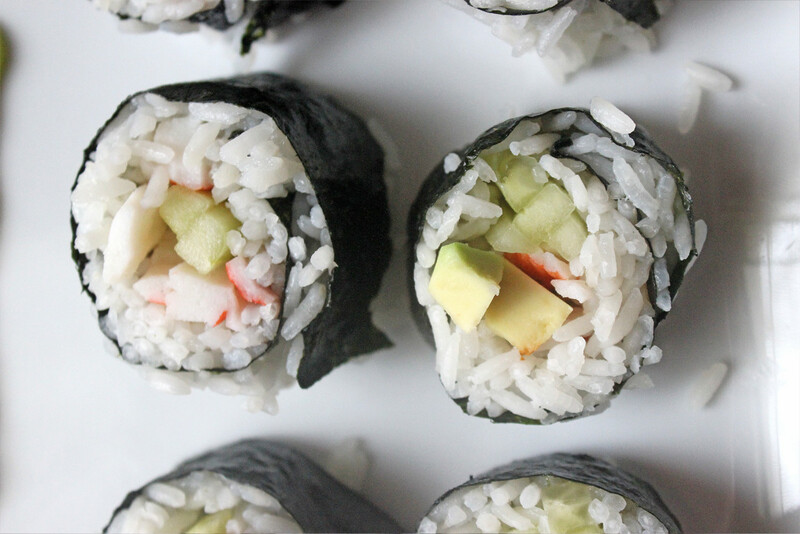 These homemade sushi rolls are also a perfect party food. You can easily make them earlier in the day to save time. Plus, sushi can get expensive. 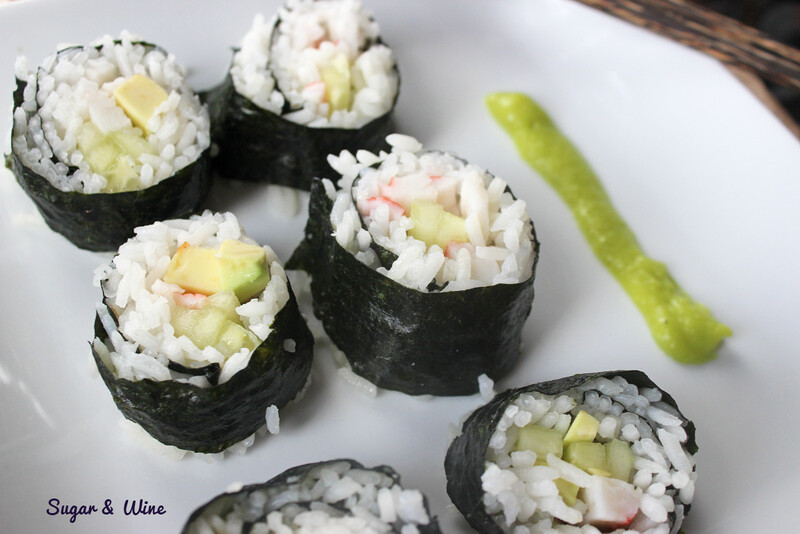 Three rolls can set you back $20 easy so making your own sushi rolls will save you a ton of money. Prepare the white rice per the instructions on the bag. It will take about 15 minutes for it to cook. While the rice is cooking, prepare the sauce to make the rice sticky. In a small pot, mix together the rice wine vinegar, sugar and salt. Heat on medium, stirring occasionally until the sugar and salt has dissolved. Place in a bowl or jar in the refrigerator to cool while the rice finishes cooking. Also prepare/chop ingredients while you wait. Once the rice is done gently mix in the sauce and let it sit for a couple of minutes. Lay out the mat on a flat surface. Cover the mat with a piece of saran wrap. Place the seaweed down. 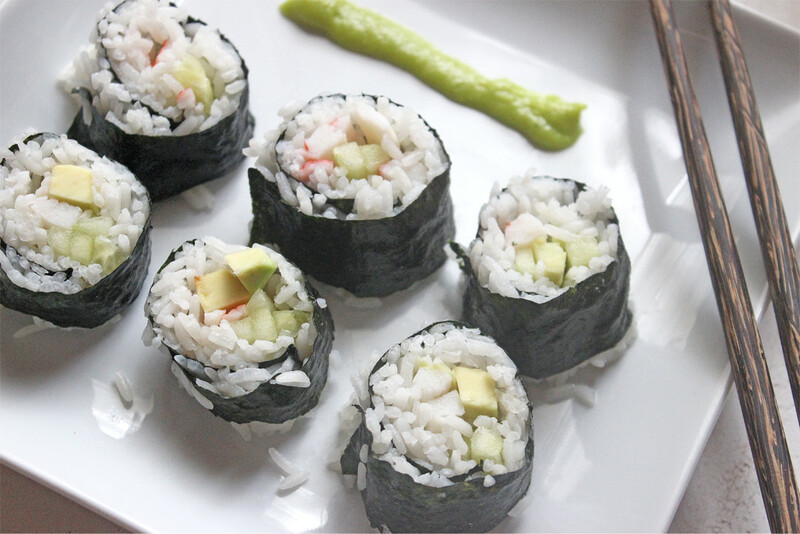 Cover the piece of seaweed with rice using your fingers. Have a bowl of water handy to dip your fingers into to keep the rice from sticking. Place your filling on the bottom third of the rice. Roll the mat once to cover the ingredients and squeeze it tight. Open the mat and peel the saran wrap off and place it back on the mat. Roll the mat again and squeeze tightly. Repeat once more. Then, remove from the mat and cut coins with a sharp knife. I also wet the knife when cutting so that the rice doesn’t stick.